We tune and troubleshoot rails apps. We have experience diving deep into hundreds of production Rails environments. Get a fresh pair of eyes on your code and infrastructure. Gain insight and confidence into your application environment and infrastructure. Keep working on your app — we’ll investigate and deliver a clear and detailed report complete with code suggestions, config tweaks, and next steps tailored to your business. with a turnaround time of 2-3 weeks. Get immediate attention and hands-on assistance with your most urgent issues in production. We’ll dive right in and help your team diagnose and resolve the issue at hand. We do our absolute best to not only determine root causes but provide recommendations for avoiding trouble in the future. for our exclusive and immediate attention. 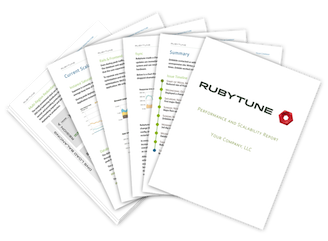 Every rubytune engagement comes with a detailed report documenting work performed as well as suggestions for future stability and growth. Joshua Sierles worked in security and systems administration since the early days of the web. He joined the Ruby on Rails movement in its infancy. He debugged, deployed and scaled Rails applications at Engine Yard. He helped build the Basecamp ops team and infrastructure, and built a popular set of Chef recipes. He is a Chef contributor and evangelist as well as the author of the Chef Peepcode screencast. Joshua (github, twitter) lives in Sevilla, Spain and plays flamenco guitar. Sudara Williams is a full-stack kinda guy who enjoys chewing on the tough bits. He wrote his first (and last) programming book in the 6th grade. He built and managed an IT support business in Santa Fe, then returned to app development and fell in love with ruby in 2005. He later worked at Engine Yard, helping clients such as Github, Groupon and New Relic do the hard stuff. He runs Ramen Music and alonetone, the open source artist platform. Sudara (github, twitter) lives in Vienna, Austria and plays Bach on the piano and Scruggs on the banjo. Just FYI, @jsierles and @sudara at rubytune are superheroes. When it comes to tuning critical Rails applications, Sudara and Joshua are two top picks. Over the years, Joshua has given me invaluable advice, from Rails deep dives to Chef server provisioning. Highly recommended. I’ve worked with both of these guys. They know what they’re doing. We would be happy to discuss your app and your systems and help you determine your needs. Our rate is $265/hour with a 10-hour minimum.